. . . in this country is an amazingly elastic affair, followed from the lips of a judge. Forgive me for recording one tale that struck me as new. It may interest the up-country Bar in India. 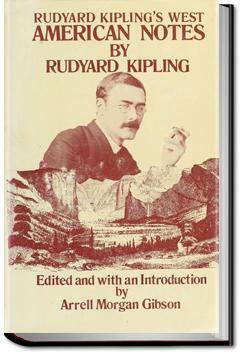 An interesting account of Kipling's travels in the USA and his reflections on what he found in 19th century America. A very politically incorrect travelogue like what Mark Twain wrote. Mark Twain was making his living off travel memoirs in the Gilded Age -- a name he came up with in a novel of the same name. He made fun of the world making fun of Americans. I love Kipling, usually. But here, he's writing from a position of white, powerful, privilege and British superiority, and was soon turned off. Kipling looks at Gilded Age America. Kipling's biased rant on how America is an uncivilized wasteland that has fallen far from it's former motherland.